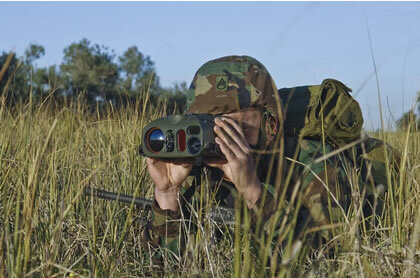 Highly sensitive, low power consuming thermal and low-light imaging sensors employed in lightweight, hand held optronic imaging systems used by commanders, forward observers, fire controllers and recon teams, facilitating better situational understanding, target location, coordination and control. These lightweight and compact hand held imagers combine several types of sensors, including cooled or uncooled thermal, video imagers for daylight or low-light level conditions, laser rangefinders, target marker or laser pointers. Additional equipment includes GPS, integrated map display and communications interfaces. 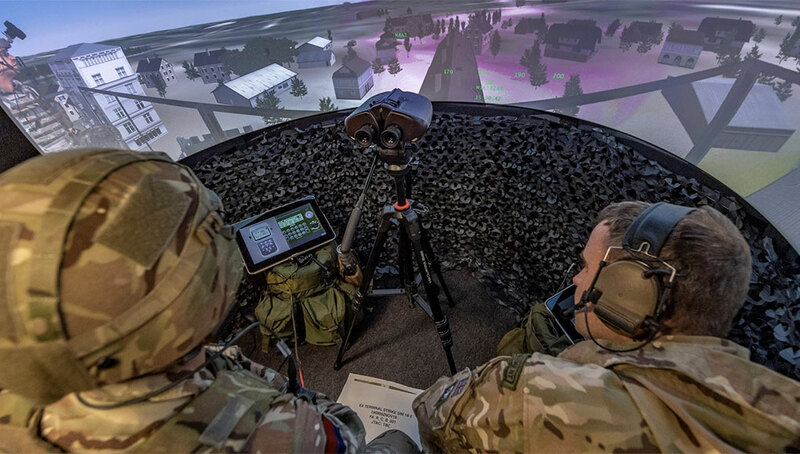 Combined with miniature or lightweight laser designators, such devices are transformed into a ‘trigger’ employing remotely fired laser guided munitions. Hand held thermal imagers from different makers were displayed at AUSA 2008. Systems included the MilCam series from FLIR Systems, Opus H from Carl Zeiss Optronics, the Moskito from Vectoronix and various systems made by Northrop Grumman and Elbit Systems, currently employed by the US Army and Marine Corps. 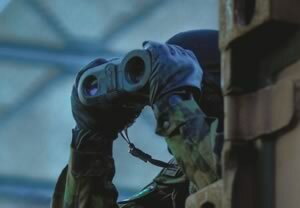 FLIR Systems displayed the MilCAM series Recon III handheld thermal binoculars, providing situational awareness, assisting the tasks of targeting and surveillance. The company introduced two new Recon III models. The Ultra-light version weighs only 5 pounds (2.3 kg) and uses a large format (640×480) long wave VOx Microbolometer with new automatic digital image processor. It is powered by two Lithium D cells sustaining up to four fours of operation. 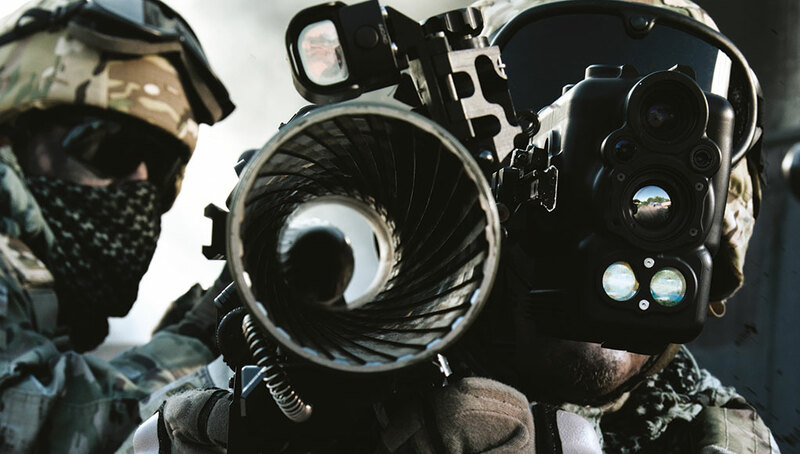 Enhancing target discrimination in daylight operations, the new and compact Recon III Lite thermal binocular combines the same sensor used in the Ultralite model with high resolution (768×494) color video camera. Both sensors are fitted with x4 continuous zoom and can be presented on the system’s integral OLED display in a full screen or split screen format. This version can also accommodate an optional laser pointer and additional memory to store up to 100 JPEG images, or download images to an external device via a USB connection. 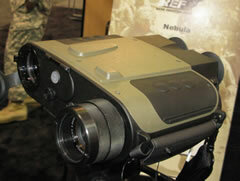 The ‘Nebula’ thermal binocular sight displayed at AUSA 2008 by the US Army Rapid Equipping Force was shipped to the US Forces in Afghanistan, to meet an urgent operational requirement for improving night performance. 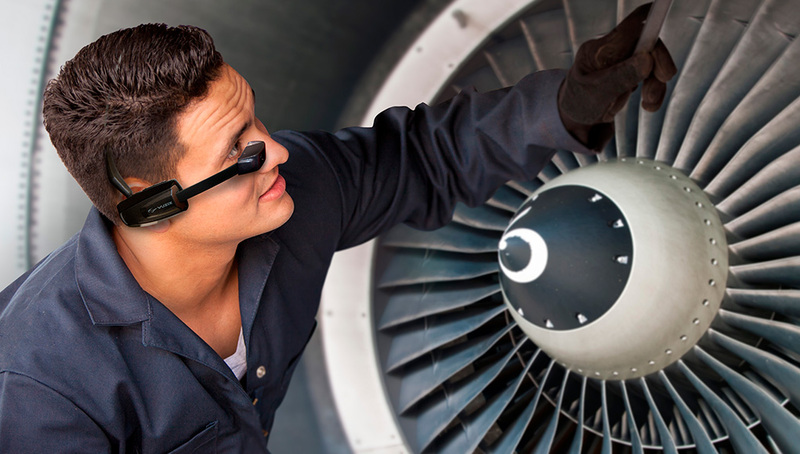 Carl Zeiss Optronics displayed its laser target localization systems called Opus H. The new device employs a direct view optical channel with x7 magnification (saving power operating in daylight) and an uncooled IR channel, laser rangefinder and digital camera. It has integral digital compass and GPS. Opus H weighs about 2.9 kg without batteries. It is powered by 8 AA batteries sustaining 3.5 hours of operation. Elbit Systems displayed the PAS-22 Long Range Thermal Imager (LRTI) recently selected and delivered to the US Marine Corps. 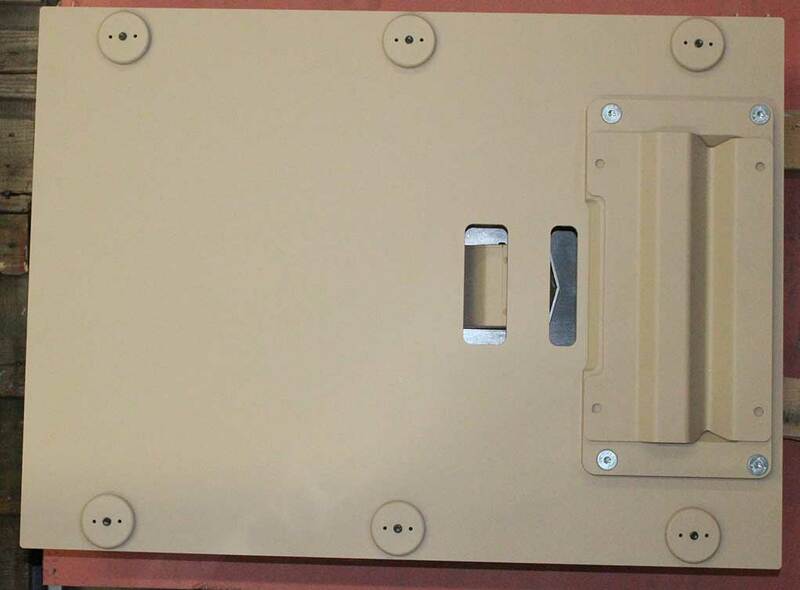 This device was developed for use by dismounted infantry, scouts and special forces, for surveillance and target acquisition. It can also be used as a night-sight for medium range weapon systems. Weighing about five pounds, this multi-sensor thermal binocular uses a cooled 320×256 InSb focal plane array sensor providing optimal range/sensitivity performance. The system supports two fields of view for situational awareness and target identification. The system has an optional magnetic fluxgate compass and GPS to provide target location information. As enhanced version is the AN/PAS-25 Thermal Laser Spot Imager, the high performance, hand held thermal sight is designed with laser spot tracking capability. This system can monitor the aim point of a laser designator beam, or laser rangefinder ‘spot’, assisting target identification. 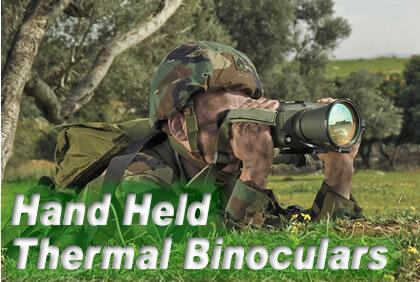 A new device recently added to the family is the Medium Range Thermal Binocular (MRTB), employing a high performance uncooled Long Wave InfraRed (LWIR) thermal sensor. Coupled with x3 optical zoom designed for narrow-field of view, MRTB offers better range performance, compared with systems relying on electronic zoom. The new binoculars weigh only 3.75 pounds (1.7kg) and are integrated with laser pointer, magnetic flux compass and an optional IR pointer see-spot day camera, facilitating day and night operations. 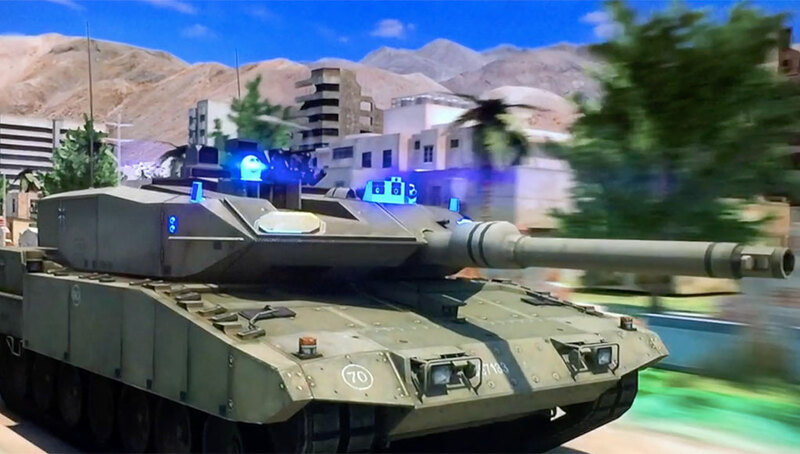 Another system called MARS is being developed by Elbit Systems and has recently won a large order from the Israel Defense Forces. MARS is a hand held thermal imager developed specifically to address the infantry’s requirements defined by the IDF ground forces command. The system integrates an uncooled thermal sensor, day channel, laser rangefinder, GPS, compass and integral recording system. 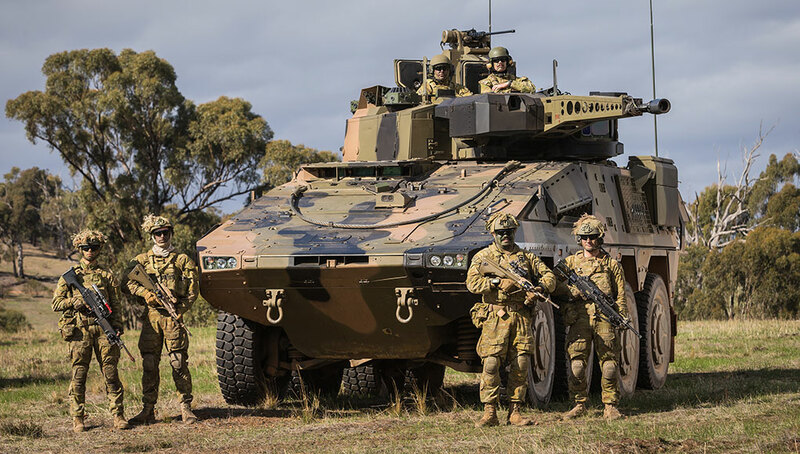 Designed for Special Forces, infantry leaders and commanders, MARS maintains light weight and low power consumption for sustained dismounted operation. The Swiss company Vectoronix is introducing the Long Range Thermal Video(LRTV) system. At a gross weight of 7.4 pounds, the system consists of a cooled thermal imager and color video camera as primary sensors, coupled with an integrated laser rangefinder, digital magnetic compass, GPS and laser pointer. LRTV also includes PLGR/DAGR interface to integrate into target acquisition systems. Its operational range is about 5 km. The company also provides three popular laser rangefinders – the hand held Vector, a 3.75 lbs system capable of ranging targets up to 20 km, the smaller, compact, night-capable Moskito, designed for lower weight (2.65 lbs) and similar short-range performance. 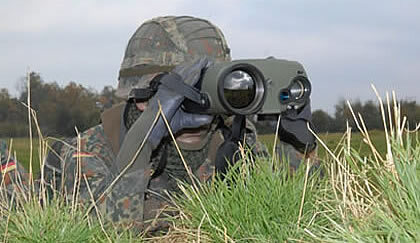 The Moskito can range a standard NATO target at a distance of 4 km, while a distance to a man-sized target is determined at maximum range of 2 kilometers, similar to the much powerful Vector type rangefinders. An even smaller ranger is the pocket-size PLRF, weighing only 1.4 lbs and capable of ranging man-sized targets at distances of about one kilometer. 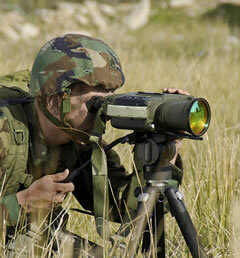 Northrop Grumman has recently received a $128 million contract to provide the Lightweight Laser Designators Rangefinders (LLDR) systems to the U.S. Army. 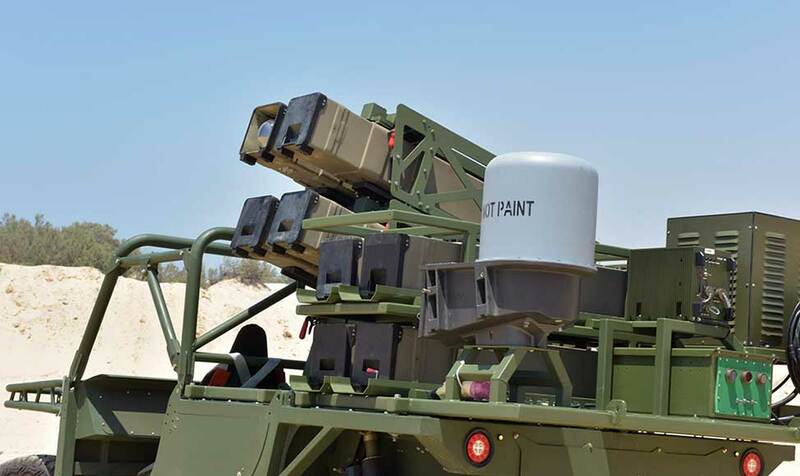 The systems are designed for day and night operations and are providing essential precision fire direction to forward air controllers and forward artillery observers. Fielding of more LLDRs is required to meet the growing share of precision targeted weapons in the battlefield. With the system, forward observers can recognize targets, find the range to a target with the laser rangefinder, and calculate the grid coordinates with built-in GPS, elevation and azimuth capability. Utilizing the target designator element, the system can also be used to guide laser-homing weapons for high precision attack.